From my lessons I have a vague memory of my petrifying instructor - Steve - barking out confusing orders on what to do if you lose control of the car. Alas, telling me this when sitting in a line of stationary traffic on a sweltering July morning had little effect. Later, when I found myself on an icy road one freezing morning, I panicked and realised I had absolutely no idea what to do if I lost control of the car. Do you steer into a skid? Or is it away? I couldn’t remember a thing. It was only after the event that I was told it’s best to steer into a skid - so armed with this information I went back on my way, sure to tackle any potential incidents with ease. However, it’s one thing to know this information, and something else entirely to put it to use in real situations. That’s why last week I spent two hours with ex copper Andy Wesley on a skid pan. 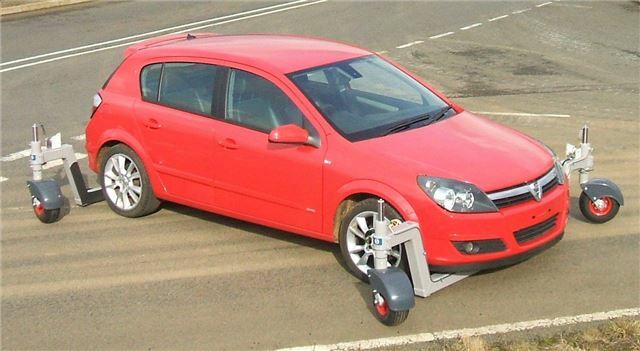 Using a Vauxhall Astra modified by the addition of hydraulics and some tiny wheels, Andy took me around demonstrating what to do when you find yourself in a car that’s skidding, or if you were to lose control completely. Using the cars modifications to mimic the different weather conditions, I was taught how to steer and regain control of a skidding car. Keep off the brakes and get that clutch down is something so simple that was never taught to me during my driving lessons! I learnt emergency stops (with and without ABS - very handy if you have an older car) and what to do when you’re skidding on a hill, braking on corners and what it means to oversteer and understeer in skid conditions - and how to rectify this. Andy, the instructor, is a retired officer and works in connection with Bedfordshire Police Partnership Trust, the aim of which is to educate people (and not just new drivers either) about road safety. It’s often simple things that people don’t realise and what Andy does is fill in those gaps of knowledge through fun practical tasks. When I first got in the car with Andy and he demonstrated what it feels like to lose all control of a vehicle and it was terrifying, but two hours and a lot of practical experience later, I left feeling confident. It’s fun and worthwhile and most importantly could be the difference between a scary skid that you know how to handle, or a bone crunching accident. For more information on the course, click here. You can also email Andy Wesley by clicking here.